Below is a training tip excerpt from the complementary “7 Secrets to Procurement” teleclass I recently held. The telelclass served as a preview to our upcoming procurement intensive in December. Thus far, over 50 students have enrolled in Big Ticket Procurement Secrets to learn all the ins and outs when it comes to asking, selling, and getting donations. If getting items, especially getting “better” items, is your auction pain point, please note that the affordable two-pay option closes in a few days. 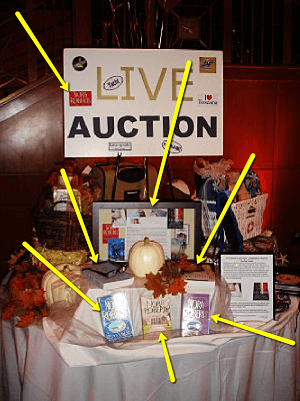 In my recent teleclass on procurement, I shared an easy way to get donations from authors. I gave some tips on finding the best authors to ask for donations and how to go about asking them for a donation. Sounds logical, doesn’t it? Ask an author for a collection of signed books. Yet that’s not the best donation. A better ask is to solicit advanced reading copies. Few volunteers ever ask (or know to ask) for something like that. This is but one example of why auction procurement is tricky. You can spend the same effort — the same number of emails, phone calls, SASE — to get a $10 item as a $1000 item. Realizing that, let’s take this one step further. Knowing that you probably haven’t been asking for the ideal donation from an author, what have you been requesting from your baker? Interior designer? Architect firm? Chef? Local minor league sports team? Are you asking for the best stuff? People get discouraged and refuse to help again. But why should we expect anything more? Most volunteers work on an auction once a year. They don’t know what to get, much less know how to get it, how to ask for it, or how to package it. Training is how average benefit auctions can leap ahead. Training is what moves $4000 auctions into $41,000 auctions in two years. Depending on the type of training, it can save a committee time or improve the “fun factor.” Training can save money … or make money. Training can increase the happiness of the workers … or even be a way of showing the volunteers how much they are appreciated. Benefit auction training helps on multiple levels. Because procurement is core to any auction, it seems logical to first get volunteers comfortable with that. Get them feeling confident in ASKING for donations. To that end, here’s the perfect training for them. 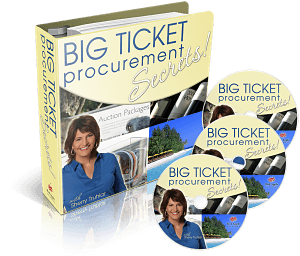 In December, I’m running Big Ticket Procurement Secrets. It’s an intensive focused on all manners of getting items. I teach about letters, scripts, approaching techniques, psychological tactics … I’m covering it all. If this in-depth course doesn’t make volunteers feel ready to conquer the auction world, nothing will. To reserve your seat in class, enroll here. P.S. The affordable two-pay option ends next Monday.